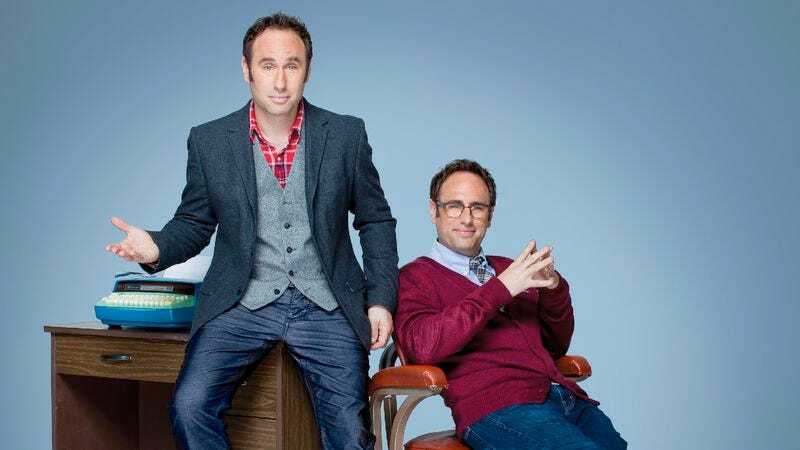 With Cheap Seats, their old ESPN Classic series, Jason and Randy Sklar had a show that felt as if it were just about perfectly scaled to the size of their talents. That might not be the kind of compliment that anyone’s going to want to take out of their press kit and hold it close to his bosom, to warm and comfort his ego on a cold and lonely winter’s night. I’m not sure how perverse a comic would have to be to want to be defined by a show on a low-profile basic cable channel that was an imitation of a better-known show on another basic cable channel, except that it recycled old clips from Wide World Of Sports instead of Bert I. Gordon movies. It was a fun show, though, and there was something about its unheralded, blink-and-you’ll-miss-it quality that nicely complimented the mildness of the Sklars’ personalities and much of their humor. There’s an honorable tradition in comedy of appearing to not want or care about much beyond crashing on a sofa and bitching about what’s on TV, and the Sklars embraced their place in the chain of that tradition. It was a show that went well with insomnia, which is why I’ll always be grateful to ESPN Classic for all the times they scheduled multiple reruns in the general vicinity of three in the morning. Still, you can only spend so much time hiding in the rec room. The brothers’ new History Channel show actually gets them outside in the sunlight, which might at least make their doctors happy. The format of United Stats is designed to give any math nerd in the viewing audience a chubby. The brothers pick a topic and then gin up excuses to travel around, meeting experts in some field or other, and ask them questions about said topic, always bringing the conversation back around to what they keep calling “the numbers.” Tonight, the subject was death, specifically which of the many potentially lethal things we fear the most is likeliest to kill us. To kick things off, the Sklars conducted man-on-the-street interviews, asking strangers what they were afraid might kill them. “I’m really scared of being impaled,” declares one brave soul. Another subject was a woman whose greatest fear involves “the world running out of chocolate.” Actually, she seemed to be included in the reel just so that we could see the brothers staring distractedly at her massive chest. The Sklars, God bless them, are not without their hacky side. There were brave, two-fisted assaults on the likes of Ryan Seacrest, Kate Moss, Suzie Orman, and the hamburger-eating technique of David Hasselhoff. The Sklars’ celebrity jokes tend to have the flavorless, prefab, fill-in-the-blank quality of a Mad Lib, and at different points in tonight’s episode, they basically told the exact same joke about both John Tesh and Yanni. Of all the comics who’ve come along in the past 20-odd years who have one foot in the alt-comedy scene, I suspect that the Sklars would have once fit in best alongside Foster Brooks and Nipsey Russell at a Dean Martin roast. The premiere episode works best when the Sklars have to actually—well, work a little. On the grounds that lots of people are scared of snakes and lots of people are scared of flying, they trek out to the Mojave Desert so that Jason can have a parlay with a snake wrangler, while Randy talks about planes with a pilot. The plane stuff has a bit of an edge to it, mainly because the pilot wastes no time in making it clear that he finds Randy to be about the least amusing human being he’s ever come across. The scenes with the snakes are even better, partly because the wrangler has an offhand, wry manner that sets off Jason well, and partly because live snakes make great props. Grabbing a bag, Jason looks inside it and yells, “There’s a snake in here! Do they like it when you shout around them?” Snakes are deaf, shrugs the wrangler, so they’re pretty much indifferent to things like the volume control. Soon Jason is festooned with long, brightly colored, highly telegenic snakes. When he nervously asks if he has any reason to be concerned, the wrangler tells him that he’ll be fine so long as the snakes don’t head for his jugular. Since I thought the guy was going to say something else as soon as I heard the soft “g” sound, I have to believe that Jason thought the same thing, and he gets points for staying classy and not saying anything about it. On the other hand, when a doctor walks them through the dangers of the average American home, the sequence is a dud, because the doctor is boringly good-natured and most of what he had to report is old news. Cutting up a chicken that’s been treated with something that makes the bacteria glow in the dark and then turning off the lights so we can see how the bad stuff gets spread around? That’s just CSI on an off night. And Hotel Impossible got there first with the news about how we should all just boil our TV remotes and take our chances. At the end of the hour, the Sklars honor their sports-TV backgrounds with a death match bracket, pitting different ways of getting killed against each other in a “There can be only one!” spirit. Lightning beats fireworks, avalanches trump floods, and as for being fatally poisoned by your food versus choking to death on it—well, as Jason points out, “There’s a lot of Heimlich awareness out there.” There’s not a lot of surprise to the final outcome: “Heart disease”, Randy concedes fairly early on, “is made for a deep tournament.” It remains to be seen whether United Stats is made for a full season; the Sklars remain agreeable hosts for this kind of nonsense, but they’re not such inspired funnymen that they should be asked to carry the whole load when the nonsense isn’t up to par. But if the numbers can hold up, this has the potential to be a decent early-summer time killer. I spend little enough time messing with snakes while drunk that I already feel better about that particular constant primal dread, so that’s something. I’m more worried about giant meteors hitting the Earth than I was two hours ago, though. 98 % of the people who are bitten by snakes in this country are men. 40% of them were drunk at the time. One of those “I didn’t actually know this, but now that you’ve told me, it seems as if I ought to have been able to guess it” moments.